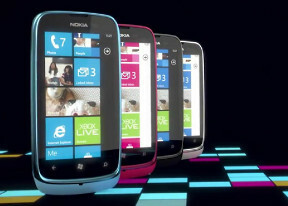 The Nokia Lumia 610 has a 5MP camera (photos have a maximum resolution of 2592x1944) coupled with a single LED flash. The camera app on Windows Phone offers very extensive settings, ranging from scenes and effects to white balance, contrast, saturation, sharpness, ISO and more. You have a dedicated Macro mode but no face detection. The flash can be set to auto, always on or off. We like the shutter key on the Nokia Lumia 610. It's very soft to the touch and with distinct half-press. The quality of the shots produced with the Nokia Lumia 610 camera is rather mediocre. Resolved detail just isn't up to 5MP standards, colors look washed out and the camera obviously struggles in low-lit scenes. The white balance is often off too. We have to admit we liked how fast the camera was on the Lumia 610, shot to shot times were really zippy. Still the Lumia 610 is okay for those coming from lower megapixel phones and will do the job in case of an amateur photo-shoot emergency. The Nokia Lumia 610 steps up in our photo quality compare tool to face other 5MP shooters. It turns out that the its snapper is better suited to the studio environment and did slightly better here. It's not exactly a world beater, but at least it's average on the second and third charts and really good on the first one. The tool's page will give you more information on what to look out for. The camcorder interface is identical to the still camera's and has plenty of features too. You can use scenes, set contrast, saturation and sharpness, change the white balance or exposure compensation and also apply image effects. You can use the LED as a video light too. The Nokia Lumia 610 shoots video with up to VGA resolution, which just doesn't cut for a good smartphone anymore. Continuous autofocus is available while recording. Unlike the Lumia 710 and 800 though, which were a bit too eager to refocus, especially in scenes with movement, the Lumia 610 chooses to lock focus in the center of the scene and keep it there for quite a while before the continuous autofocus eventually kicks back in. We've prepared an untouched VGA video sample (0:12s, 2.36MB) from the Lumia 610's camera for direct download. The bitrate is a low 1600 Kbps, meaning that the videos taken with the Nokia 610 can't really preserve much detail.